Update: If President Trump's tweet was not enough, White House spokesperson Raj Shah has just confirmed that tax policies need to catch up to Amazon, and President Trump would support tax changes aimed at leveling the playing field, which now favors the online retailer as Amazon has advantage over brick and mortar stores. 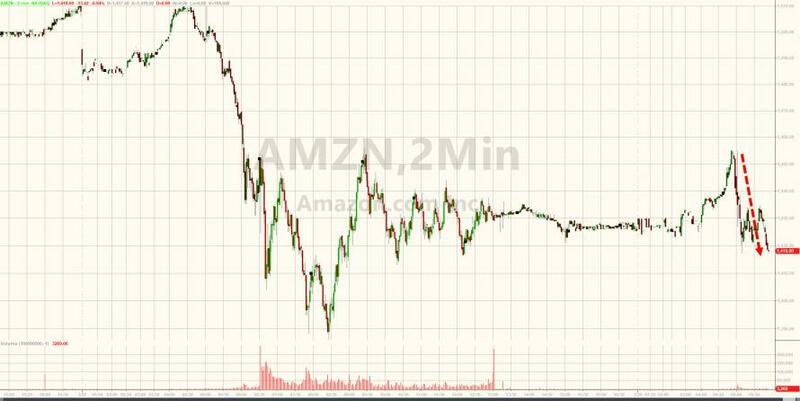 However, as we countered, none of this is new and Trump's feud with Amazon reemerges periodically, although on Wednesday it came at an especially sensitive time for the tech sector, which had gotten clobbered in recent days, making it especially sensitive to negative news (one almost wonders if someone had bought AMZN puts ahead of the Axios news). And, as if to underscore what we said yesterday, moments ago Trump himself said that he has stated his concerns with Amazon "long before the Election" and said that "unlike others, they pay little or no taxes to state & local governments, use our Postal System as their Delivery Boy (causing tremendous loss to the U.S.), and are putting many thousands of retailers out of business!" Trump's tweet comes just hours after White House press secretary Sarah Huckabee Sanders denied the Axios report on Wednesday, and said that the administration isn’t considering any changes in policy directed at the company. Which means that the bad blood remains and that nothing has changed in the two or so years since Trump launched his campaign against Jeff Bezos (who also owns the Washington Post, which over the pastg year has made it overly clear what its feelings toward Trump are). So will today's confirmation that Trump is again on the war path against Amazon - and Jeff Bezos - serve as today's tech selloff catalyst? Keep an eye on AMZN stock for the answer.